When I received a sample of this yarn, I didn’t know what to do with such a small amount of lace yarn -- and then it hit me, it had to be a beautiful bookmark, so I could combine both my love for reading and for knitting. 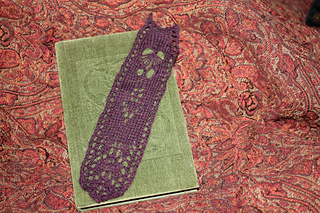 This is a beautiful lace bookmark, featuring a flower and a butterfly in the centre of it. 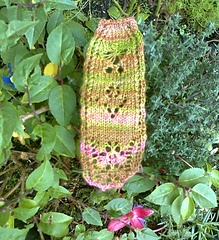 Despite the intricate looking pattern, it is a quick knit if you have a bit of experience in lace knitting. It could make the next gift of a book from you that much more special, if you added this beautiful bookmark. Gauge doesn’t really matter much, but thicker yarn will result in a larger bookmark -- and as you can see it isn’t that small to begin with.